He's not Tom Hanks. And he's certainly not stranded on a deserted island. But like Hanks’ character in the movie, “Cast Away,” Steve Hofstede does have his own trusted companion named "Wilson." And it's all thanks to his chemotherapy nurses at Mayo Clinic Health System -- Northland in Barron, Wisconsin. According to the Barron News-Shield (subscription required, sorry), as part of his chemotherapy treatments, Hofstede had been given a chemotherapy infusion bag that he told his nurses he was going to call "Wilson" after the famed volleyball in the movie. Hofstede added that in addition to the name, he was considering doing a full Tom Hanks by "drawing a face and tall, spikey hair on his bag, to represent his own version of 'Wilson.'" That was all the inspiration his care team needed. 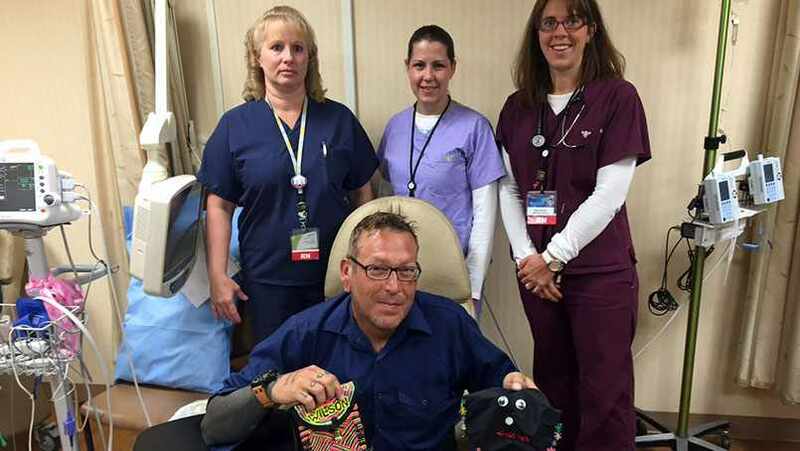 Led by nurses Stacy Cole and Tammy Loos-Skarpness, Hofstede's team stepped up their care-giving game by "bejeweling" his infusion bag. Cole tells us that she used her daughter's beads and crafts to decorate the bag and hand-stitch "a face, including eyes and a smile." The team “also attached a bell to the side of the bag” after Cole “remembered a story of a guardian bell being given to people for good luck. I thought that was very fitting." Cole, Loos-Skarpness and others surprised Hofstede with his sparkly new infusion bag during his next chemo appointment. And according to the News-Shield, it was a smashing, sparkling, bell-ringing hit. "I thought it was the best thing ever,” Hofstede tells the paper. His care team, however, didn't stop there. The paper reports that when Hofstede was given a new infusion bag that could be worn on his belt rather than around his shoulder, his nurses got crafty again. But this time, they brought in the talents of Alicia Bourget, Pathology, who used her considerable skills with puff paint to cover Hofstede's new bag. In addition to a colorful new design Bourget added the words, "strength, bravery, courage and spirit” to provide encouragement and support to Hofstede as he continues to battle his cancer. And when they were done with bag number two, Hofstede's care/design team "topped it off with one special word: 'Wilson.'" Cole tells us the team’s design efforts were just their way of trying to turn a "sad situation" into something more positive for Hofstede. As chemo nurses, “we end up getting pretty connected to our patients and their families," she says. "So we try to make our chemo room a place of laughter rather than a sick room. And anytime that someone can smile and have a little bit of enjoyment during their treatments, we think that helps them feel better and gives them a better outlook on their situation." Bedazzle us with your outlook on this story by sharing your comments below. Then, you can share this story with others using the handy social media tools atop this page.